Italian style in a bottle. Wine of Italy. 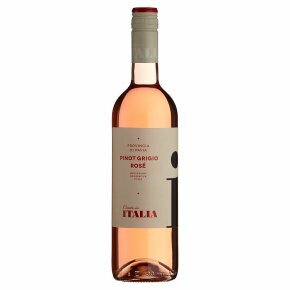 Italia Pinot Grigio Rosé comes from Provincia di Pavia, in the Lombardy region of Northern Italy. Tastes of? Fresh and fruity with luscious strawberries and summer berry flavours. Enjoy with? Linguine - 'little tongue' -This traditional pasta from Northern Italy is delicious tossed with olive oil and served with oven baked fish.